After more than 250 years of service, the Pharmacy at Stroud General Hospital closes at the end of April 2015. We can reuse Fisher’s [i] words about the original Dispensary in Stroud and apply them to the Pharmacy: “It left a history of which we may be justly proud”. The Pharmacy has its origins in the 1700s – Robert Brown was an apothecary in Stroud in the 1720s [ii]. In 1755 the “Dispensatory” was described as a “laudable scheme” to support and relieve the poor “in their state of sickness and consequent distress”, and had already established a good reputation. The Dispensary, funded by annual subscriptions, provided free medicines and medical advice to the poor of Stroud. In 1771 Dr Samuel Jones, the physician, wrote the prescriptions and kept the accounts. Mr Thomas Hughes[iii] was the apothecary (for 25 years), who dispensed the medicines – he was very knowledgeable, highly regarded, and was also a surgeon and man-midwife. In 1782/3 the Dispensary treated 774 patients; of whom 355 were cured, 6 were incurable, 18 died, and the rest improved. This cost £570, received in subscriptions. In January 1784, for each guinea paid annually, the subscribers were entitled to send one person a week for treatment. However by May the demand had increased, they were running into debt, and the number of patients had to be restricted to six patients a year per guinea (£1.05). There was more sickness amongst the poor, who were “in distress” due to the decline in the clothing trade, partly owing to “the American war”. For the year of 1785, Mr Hughes was paid £30 for dispensing the medicines, but he would only accept £25. The drugs bill was £37 9 shillings, sundries £12, and rent and coal for the physician’s room came to £2 9 shillings. The patients saw the physician in a single hired room – at Mr Mills cottage in Wallbridge for three years; then at the Lamb Inn, Church Street [iv] for six years; then adjoining the King’s Arms [v], for 12 years. The patients then had to wait outside Mr Hughes’ house in the High Street, while he dispensed the medicines. Eventually in 1805, ample rooms were rented at Richard Playne’s house in Rowcroft [vi] to include a waiting room for the patients. It cost £308 7s, and the ward paid an annual rent of £16 to the Dispensary. It had a surgeon and a nurse and was for “persons who might meet with accidental injuries, requiring immediate surgical aid; in order to avoid exposing them to the painful and dangerous journey to the Infirmary at Gloucester”. This early-1900s photograph from Howard Beard’s collection shows the hospital corner clearly. 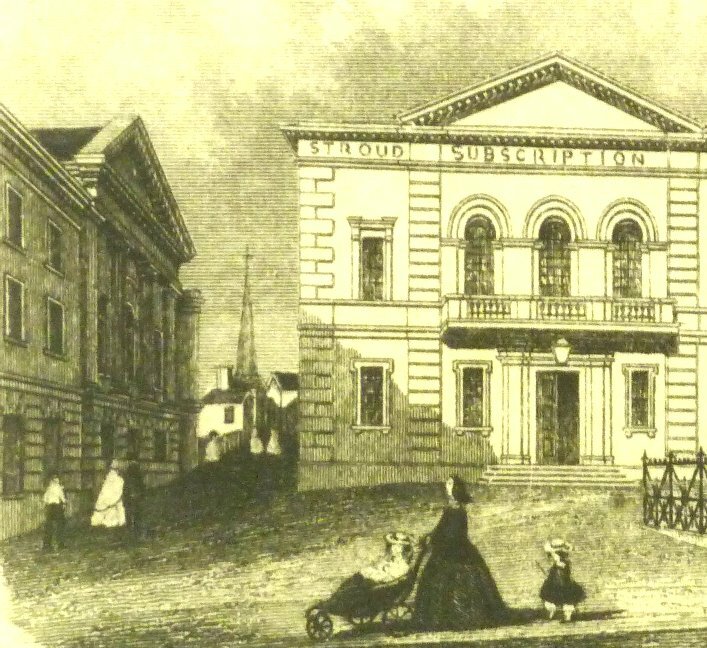 The Subscription Rooms (also paid for by subscription) had opened the previous year, and a chapel [vii] was built next door. In this 1861 engraving is the Casualty Hospital with Bedford St Chapel, next door, and The Subscription Rooms. A modern copy of this is in the Museum in the Park’s collection. Records for 1837 showed that 408 patients had been treated at the Dispensary in the previous twelve months (average cost 5 shillings 7½d each), and the Casualty Hospital had 21 inpatients and 14 outpatients in eight months. The stone building was altered in 1855 to improve the facilities, and it now provided fourteen beds, and “a properly-lighted operating room”, so operations were no longer performed in the wards. Since 1835 more than 1,000 casualty cases had been admitted (nearly 100 had need amputations or major surgery), and about 7,500 outpatients had been treated at the Dispensary. 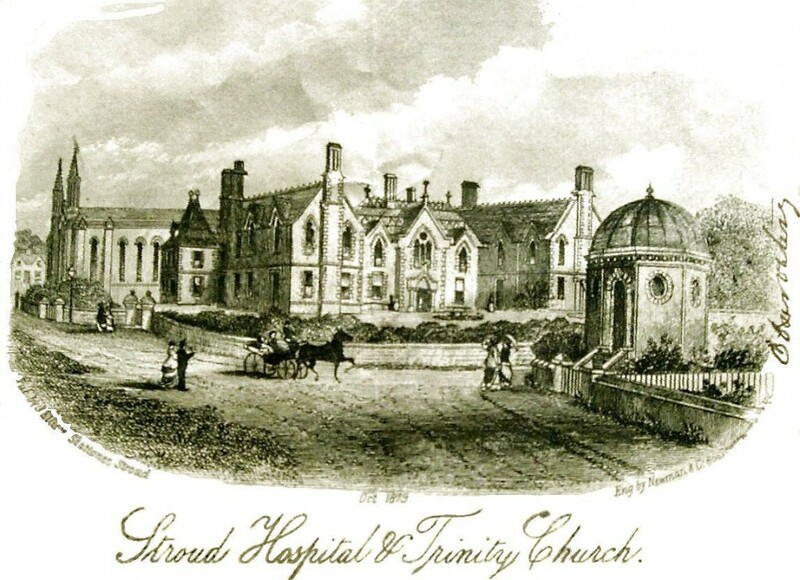 In order to increase its usefulness and enlarge its character, the regulations were revised in 1859, and The Dispensary and Casualty Hospital were renamed Stroud General Hospital. The Hospital again outgrew its abode and required new facilities. 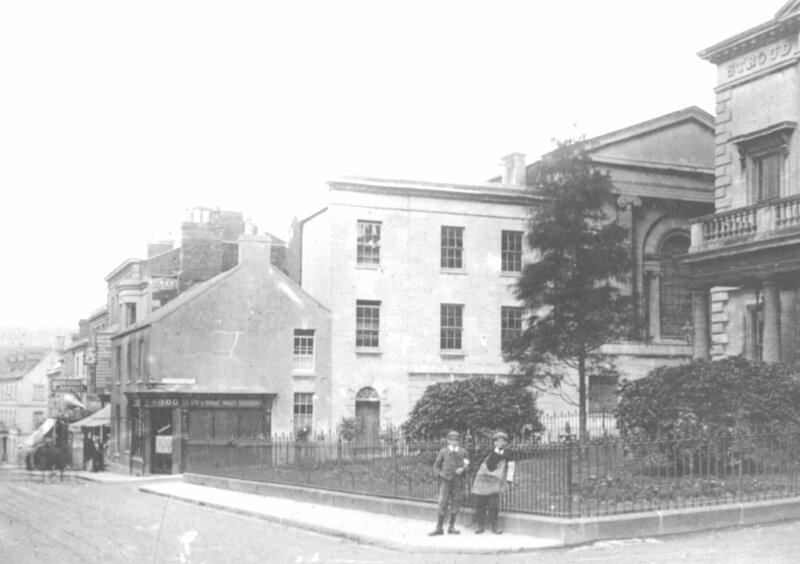 Fund raising events were very popular, and in 1873 a plot of land next to Holy Trinity church was donated. The Trustees, who had also just received a large bequest, immediately advertised for tenders to build the new hospital, which opened the following year at a cost between £6,000 and £7000, with 30 beds. This engraving, also in the Museum’s collection, is dated 1879. The Dispensary moved with the Hospital to Trinity Road in 1875 and continued to provide services for all the patients treated there. The Pharmacy Service grew to provide medicines, information and advice to all of the hospitals and units in the Stroud Locality [viii] . In the final chapter of the Pharmacy, it moved from the corner opposite Casualty to larger premises in the centre of the ground floor. The refurbishment of previous outpatient clinic rooms were kindly paid for by donations made to the League of Friends. Now, the Hospital that started as a Dispensary over 265 years ago, sadly will no longer have its own Pharmacy and dedicated clinical and medicine management team on-site. From 1st May 2015 the pharmacy services to all seven of Gloucestershire’s Community Hospitals will be provided by Lloyds Pharmacy. [i] ‘Notes and Recollections of Stroud’, written by Paul Hawkins Fisher in 1871. It was reprinted in 1986 and provides much of the information for this article. [ii] Mentioned in a 1741 title deed for the White Hart, in the FEWC archive. [iii] Thomas Hughes has been researched by Barry Harrison of SLHS. [vi] Richard Playne’s house was at St Briavels, on the north-west corner of Russell St , on the uphill side of Rowcroft. George Holloway’s statue now stands on this site. Hollybrook, Park House, Stroud General and Maternity; Tetbury Hospital, Weavers Croft, Westridge, Vale Hospital (in Dursley). now closed: Berkeley Hospital, Cashes Green Hospital, Cotswold Hospital (in Tetbury), Selsley Vicarage, Standish Hospital (whose Pharmacy was run jointly with that at Stroud Hospital).